A Story about Us. A Promise to You. 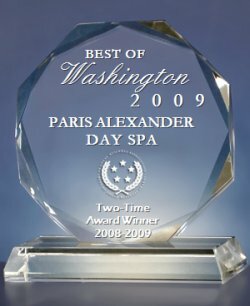 In 1994, our owner-operator and namesake, Paris Alexander, envisioned an intimate, boutique-size spa in the centrally-located Dupont Circle neighborhood, where discerning individuals would find experienced, caring practitioners passionate about skincare and wellness. 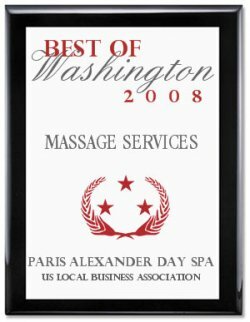 Cited as “a hidden gem,” we are honored that our commitment and our longevity in the aesthetic and wellness industries have been featured in several publications such as Essence, Heart and Soul, the Washingtonian, and CBSlocal.com as well as spotlighted in the news outlets of local TV stations and international web broadcasts. As your partner in beauty and wellness, we welcome you to a calm and restorative respite from the hustle and bustle of daily life. Our highly-trained and experienced aestheticians, massage therapists and wellness practitioners listen to you and customize their techniques to support your skin and wellness goals. Our loyal clientele appreciates the pampering, education and provision of custom on-going treatment/prevention. We offer promotional incentives for your first visit and reward your continued loyalty. Extending our spa home to you, becoming your partner in beauty and wellness, is our privilege and professional joy. "Best Place for Facials in DC!" Paris' pumpkin facial featured on global news agency!